Hiro (Kyoto, Japan) on 7 November 2018 in Plant & Nature. Excellent, the point of neatness is just situated at the right place! Beautiful frame and light! Superb details! Such a lovely moment . . Nature at her best. Magnifique prise. C'est fait avec ton 20 mm ? Great picture from the butterfly. Beautiful details and bokeh ! A good picture. Les papillons se font de plus en plus rares en Belgique, à cause de l'emploi des pesticides ! A very nice macro, the details are superb! Beautiful, i like the soft colors of the cosmos. Spot-on clarity captured in the heart of the flower! I love the eye-catching wings. 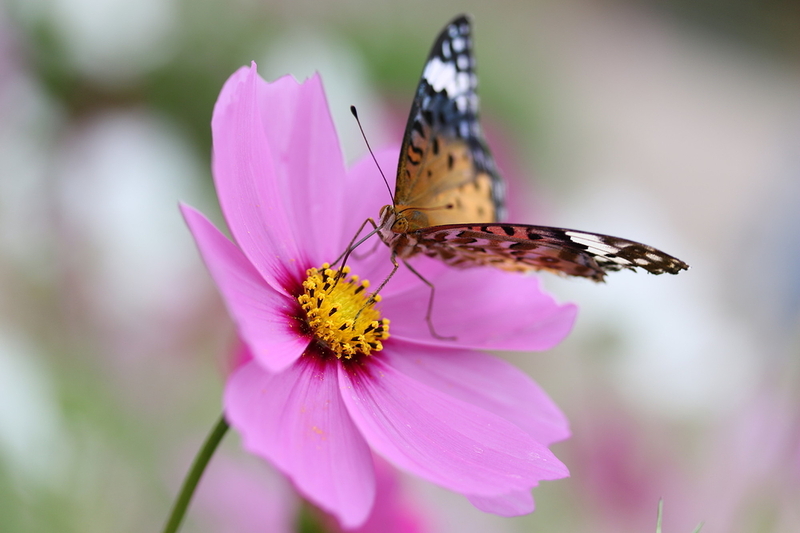 Tout un cosmos tient dans les ailes du papillon! A very beautiful and poetic image. I like it! And sharp on the eyes, super close/up. Wonderful! Such a treat in autumn. It's a beauty contest and both the butterfly and flower are winners equally. Perfect POV for perfect image.